In the dead of winter, the promise of spring is a lie. Cold permeates everything so deeply there is no way anything could emerge from winter’s grip. Green leaves, or warmth from the sun, seem but a dream. 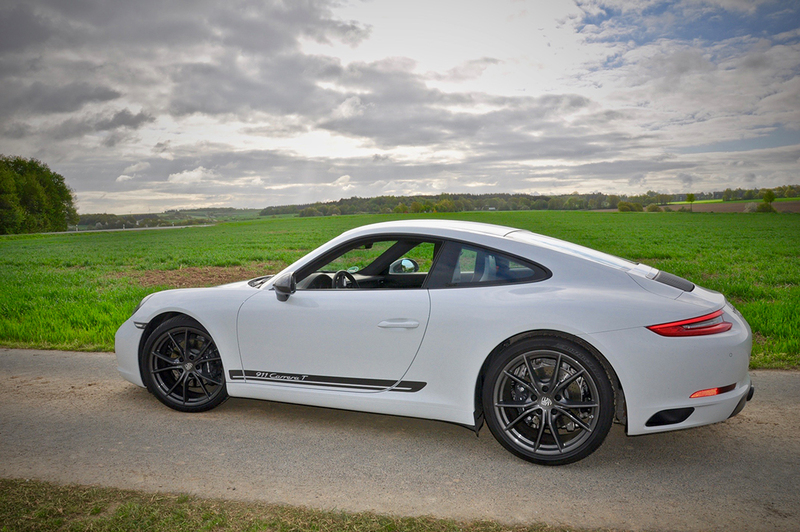 And, yet here I am, searing across Germany in an unusually early spring at some God-forsaken speed in a brand new Porsche 911 Carrera T—the company’s lightest, most pure 911 of the modern era. As the tender buds of fruit trees become but a blur, I pinch myself again. A 3.0-liter flat six produces 370 hp and 331 lb.-ft. of torque, but the turbo engine means most of the power is in the lower rpm range. 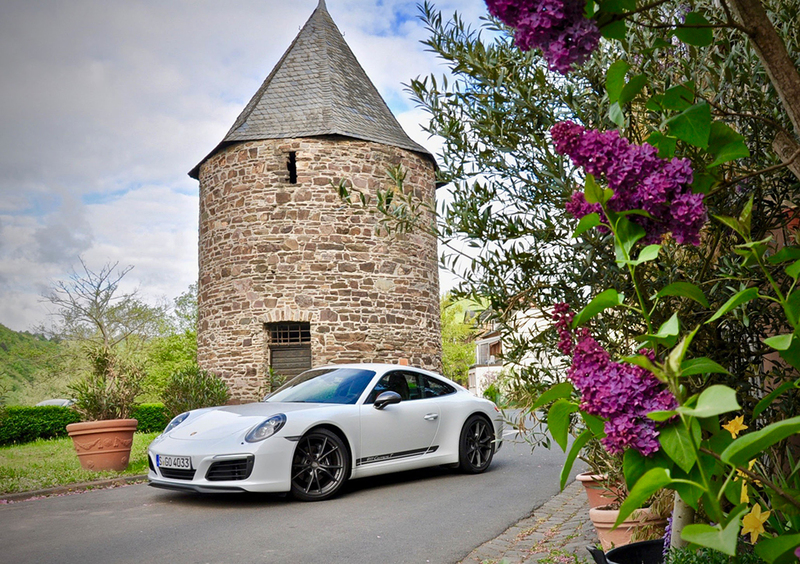 Despite turbochargers, the sound of a 3.0-litre flat six echoes off the spruce and pines of the Eifel forest, awakening not only the tall trees, but also every sliver of my being. With the windows down and the roar of the engine behind the two seats, the 911 T is the automotive equivalent of sunshine, full of light and fury and something that simply feels good as the rear wheels struggle for purchase around a tight bend and the rear of the car swings out ever so gently in a controlled oversteer. 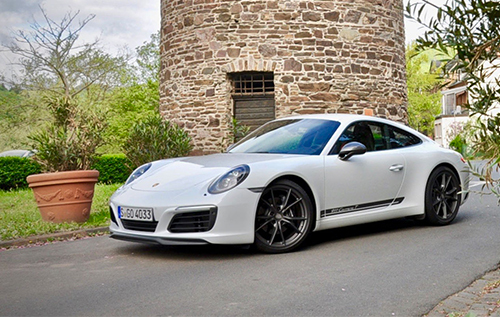 Porsche Torque Vectoring (PTV) comes standard. The system works in conjunction with a limited-slip rear differential, intelligently braking either inside rear wheel around corners as the situation demands. As it should, given the 911 Carrera T weighs just 1,424 kilograms, the lightest model in a 911-model range of two-dozen separate versions. Such airiness was meant to regain the connected feeling—the purity—that remains a hallmark of so many older Porsche 911s. Under the doctrine of less is more, the 911 T has emerged as the 911 that delivers a driving experience less cluttered than any other. Lightweight glass in the back and rear side windows, door-opener loops inside of handles and less insulation all contribute to its intimacy. Indeed, when seat upgrades mean the deletion of rear seats, the 911 T is meant for purists as much as it is for those who want a bargain in their Porsche, if such a thing exists. At $116,500 to start, the 911 T does hold value. A sport exhaust system is standard, as is the limited-slip rear differential and lowered suspension, dropped by 10 mm over a base 911. 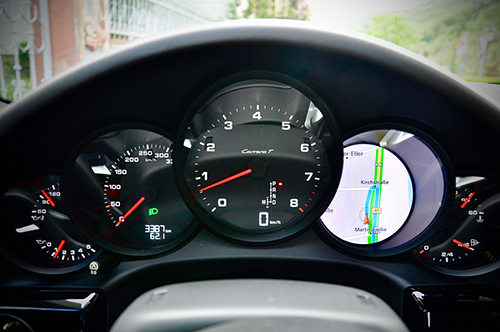 Porsche’s sport-suspension system, along with 20-inch wheels from the Carrera S, are also included. Sport seats with fabric inserts are as unique as they are comfortable. A leather steering wheel and shifter for the standard seven-speed manual gearbox feel excellent in the hands. A seven-speed dual-clutch automatic transmission, with paddle shifters behind the wheel, is optional. 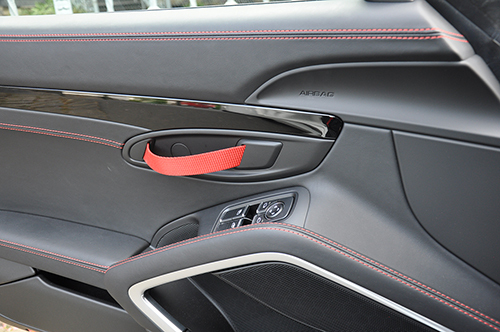 Door pulls instead of handle help reduce overall weight, and they work with surprising ease. Firmer and shorter springs coupled with stiffer anti-roll bars on the front and rear axles keep the 911 T firmly planted. Not optional are the many spontaneous grins that come from squeezing every last ounce of power from the twin-turbo, 3.0-litre flat-six engine. At 331 pound-feet of torque from a low 1,700 rpm, the 911 T charges like an angry Red Angus but keeps running well past 5,000 rpm to hit 100 km/h in about 4.2 seconds. That’s fractionally quicker than the base Porsche 911 that has the same engine and starts at a considerably less $104,000, but there’s something more magical about the way it all comes together in the T—the sound, the feel, the power all dancing in harmonic balance. Never does the car feel overpowering, domineering or scary the way a 911 Turbo S or GT2 RS can, given the incredible power of those more-expensive 911s. Instead, the 911 T feels totally manageable at all levels of speed, a faithful and willing companion that’s drop-dead gorgeous with those 20-inch wheels. 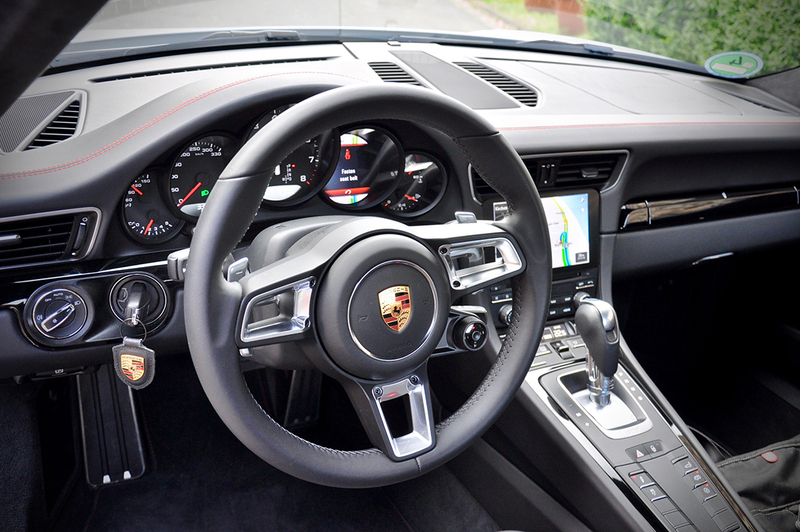 A 7-speed manual gearbox is standard, but a 7-speed PDK dual-clutch automatic is available, though the manual adds an even greater degree of intimacy. Nor does the ride punish with a suspension that is too hard or soft. Corners and bends happily submit to the T’s tenacious road-holding power, every arch delivering richly satisfying feedback through the wheel and seat. Porsche Torque Vectoring (PTV) comes standard, too; the system automatically brakes either inside wheel around corners to stabilize the turn. Drive modes can be further optimized by a small dial on the steering wheel to better suit the mood. In the Sport, the throttle sharpens, and the sport exhaust gets louder. In the Sport Plus, the engine gets louder still, and the chassis, engine and transmission all work as hard as an NHL team vying for the Stanley Cup. It’s exciting play. When not skating hard, the 911 T can cruise as comfortably, and as quietly, as many German sedans, scoring decent fuel economy, too. Inside, the cabin has all the necessities needed for a comfortable existence—dual-zone climate control, navigation, 150-watt audio system, rear backup camera. 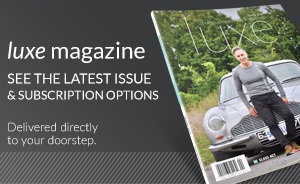 Two sound-system upgrades are available, of course, as are countless other options, including a 555-watt Bose system with 12 speakers, or av821-watt Burmester system that might produce the best sound on earth—other than the rich notes of the 911’s flat six resonating off a German forest at ridiculous speed.